Seems like a pretty safe bet that the MAHA state playoffs are going to be pretty intense at the 14U Tier 1 level. The age group that already boasts a High Performance Hockey League champion (Compuware) and a Silver Stick champion (Little Caesars) now serves as home to a Tier 1 Elite Hockey League champion, as well. 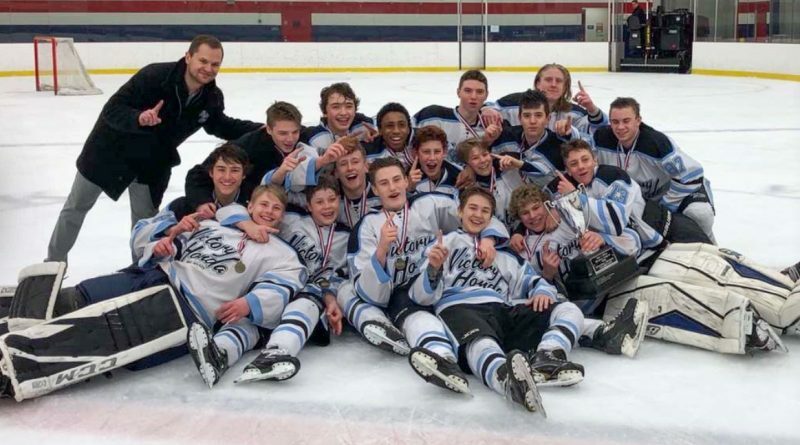 Victory Honda’s 14U boys beat the St. Louis AAA Blues 3-1 today at the Schwan Super Rink in Blaine, Minn., securing a Tier 1 Elite League title. After a scoreless first period, John Paul Steele gave VH a 1-0 lead at the 3:56 mark of the middle frame. The Blues tied it up in the closing moments of the second. In dramatic fashion, Connor Miller reclaimed the VH lead by scoring on a penalty shot at the 2:50 mark of the third period. Shortly thereafter, Connor Smith scored a power-play goal to give Honda a commanding 3-1 lead – a lead they wouldn’t relinquish. Luca Di Pasquo stopped 28 of the 29 shots he faced in the contest to record the win between the pipes for VH.